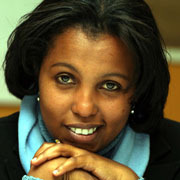 Tigist is a broadcast journalist currently working as a producer and presenter at Ethiopia’s Radio Eve. She has reported extensively on HIV/AIDS and reproductive health issues, and was awarded a Panos/Stop TB fellowship in 2005. From 2002-3 Tigist went to Nairobi with the Fredskorpset south-to-south women’s media exchange programme. She recently spoke at the Youth Media Development Forum in Bamako, Mali.